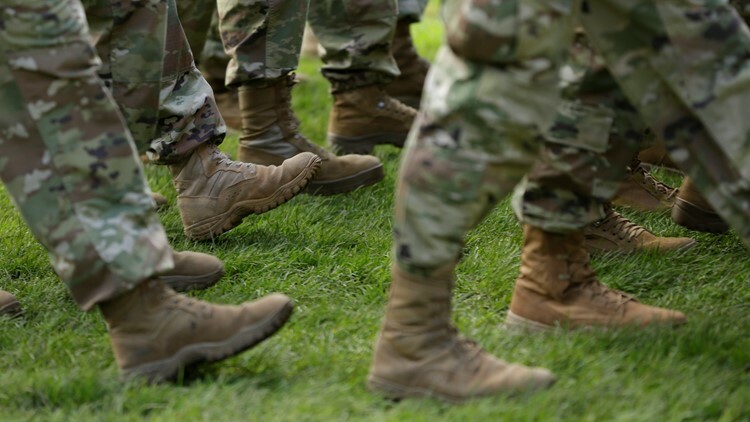 U.S. Army soldiers wear boots as they march in formation during a change of command ceremony on Monday, April 3, 2017, at Joint Base Lewis-McChord in Washington state. The survey of nearly 17,000 families across 46 states allowed respondents to describe their living conditions. A new survey of found most military families living on U.S. bases are unhappy with their privatized housing experiences, CBS News reports. Military Family Housing Network conducted the survey from late January to early February. It found black mold growing on walls, insects falling from ceiling cracks, bat infestation in attics, sounds of rats at night and raw sewage puddling on floors. The survey found 16 percent of respondents had a positive review of their base housing and 55 percent had a negative one, Reuters reported. On Wednesday, a Senate Armed Service Committee is having a hearing about the state of privately managed military housing. Reuters said its reporting on housing hazards and poor safety oversight prompted the hearings.